Handmade Items made with a touch of magic! This Mini Fairy Garden Set is a great way to start your very own Fairy Garden and to bring a little bit of magic into your garden. 3 hand sculpted Turquoise Topsy Turvy mushrooms. Approx. Size is 6.5cm tall qith the other mushrooms tapering down to 4.5cm tall. 3 sculpted Flat Blue Daisy flower assorted sizes. 3 little critters including caterpillar, ladybird and butterfly. A bag of Blue pebbles enough to make a Fairy path. A blue Fairy sitting on top of a Unicorn approx. 5.5cm tall. This set is not a toy, are fragile and not suitable for children under the age of 3years old/adult supervision is required. Items are weather protected but recommend to use in under cover areas. I bought three gorgeous mushroom necklaces that arrived today. They were well packed and arrived safely. The craftsmanship is just beautiful. I was able to choose the colours of the mushrooms and was especially happy with the custom yellow one. I wouldn’t hesitate to purchase again. 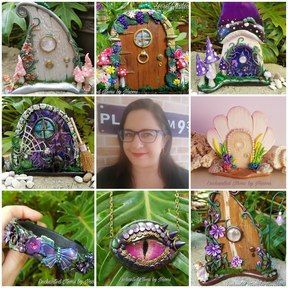 My name is Naomi and I am the Sculptor/Creator of Enchanted items - Hand sculpted Fairy Garden accessories from mushrooms to Fairy doors and Mythical/Fantasy sculptures, frames and jewellery. Based in Western Australia, I am a mum of 2, a Face painter, a Balloon Twister... as you can tell I like to keep myself busy. I have always loved making things that are a little different... Love things 'geeky', Mythical and the Fairy world. Just after my daughter's 5th Birthday Fairy party, that I created all sorts of fairy bits for... My family and friends loved my creations that much, that they encouraged me to continue my sculpting journey and 'Enchanted items by Naomi' was born. Looking forward to the future and what magic it will bring.